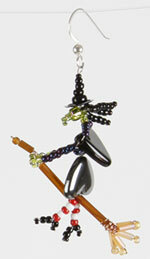 This entry was posted on October 7, 2008 at 9:27 pm and is filed under Art, Bead Art. You can follow any responses to this entry through the RSS 2.0 feed. You can leave a response, or trackback from your own site. The free instruction offer ended on 10/27/2008. They were the ones that provided the free offer, based on the royalty agreement I have with them. I don’t provide instructions for the beaded witches, sorry!